For all those people who check Google Analytics reports only for a few days after initial setup and then forgets it forever, we have news. The bad news is that you've probably missed many opportunities to fix or improve your site traffic. The good news is that it's still not too late to change the situation. We'll show you how to be aware of your project traffic without even having a clear picture of where to start. Read more about Google Analytics Statistical Significance Alerts. The easiest way to start is to setup a standard alert for common metrics like sessions, page views, and users. By having these alerts, you'll be sure that if any of metrics will fluctuate, you'll receive a notification. It's still up to you to judge whenever that traffic glitch was significant though. By checking the last few weeks averages, we ensure that number changed in a statistically significant way, but it still can be a matter of circumstances (like Christmas, Black Friday or any other event). The goal of this type of alert to get a sense of your project traffic. It will help you to move forward on more advanced tracking like custom alerts. Although by default notifications will arrive at your email you can also setup a webhook for connecting to any other software. Pro tip: adjust "Precision" in alert setup if you want alerts to happen more or less often. If you've done Goals setup in your Google Analytics but haven't yet figured out the pattern of conversions, then it's a good time to add a statistical significance alert. Before diving in into advanced custom alerts, you can measure how your Goal (which is usually based by a conversion) vary during the week. You'll receive a notification via an email or webhook each time Goal will exceed or fall behind statistical ranges. This way you'll learn a lot faster what is "normal" and what is good or bad for your project. Pro tip: use the weekly overview feature to understand the Goals pattern better. Each week you'll receive an email overview of the last 7 days Goal performance. This report will be the great information when setting up your next more advanced custom alert. Enable weekly overview email for your alert and each Monday you'll receive past week split. There will be the same metrics what you're tracking split by weekdays. You'll receive an overview despite the fact whenever you had an alert that week or not. 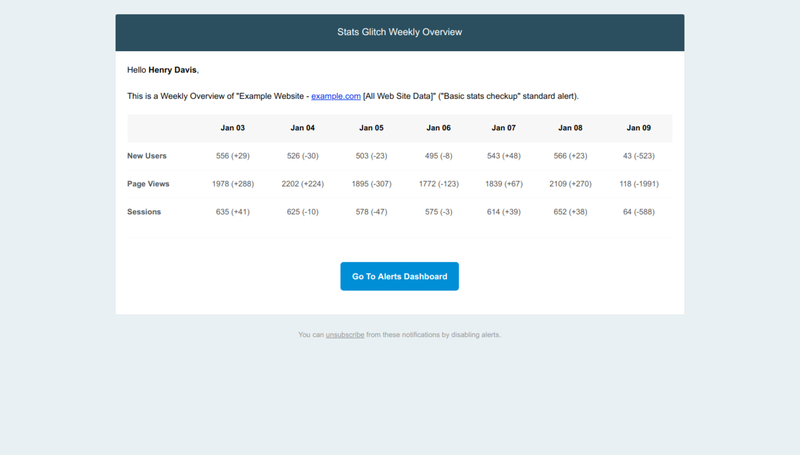 Via read-only access, StatsGlitch will watch your business metrics and generate alerts. 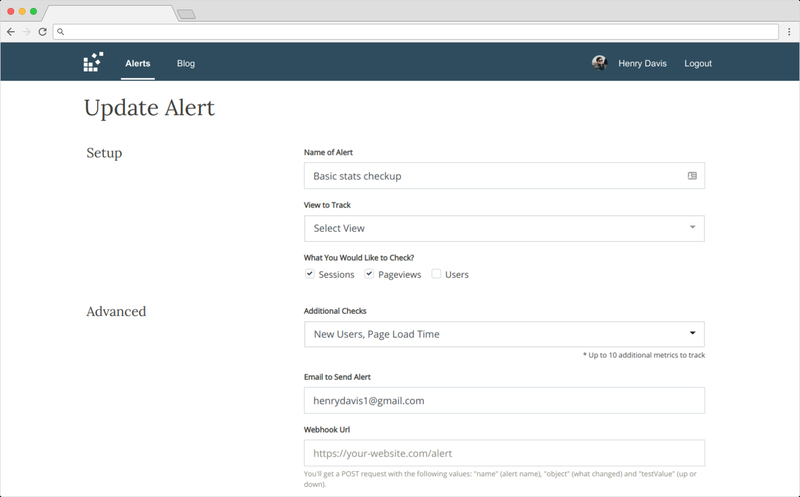 Alerts are sending via email or webhooks. The easy way to get notifications for traffic spike or goal completion. Plans from $0/mo. No credit card required.